the Presidents yard sposed the where his. The War Deptment is next the W.H. also a solid Building with about 25 Telegraph wires going in. the lay all on a little [?] Northwest of the Capitol from the Capitol you can overseea the City. 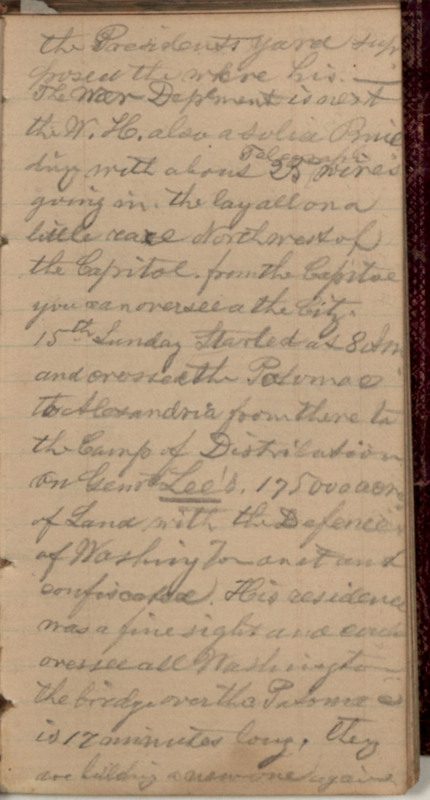 15th Sunday Started at 8 AM and crossed the Potomoc to Alexandria from there to the Camp of Distribution on Gen. Lee's, 1750000 acres of Land with the Defences of Washington on it and confiscated. His residence was a fine sight and each ones see all Washington the bridge over the Potomoc is 17 minutes long, they are building a new one again.